All ESC32´s have built in telemetry that can be accessed via the CLI or ECU. 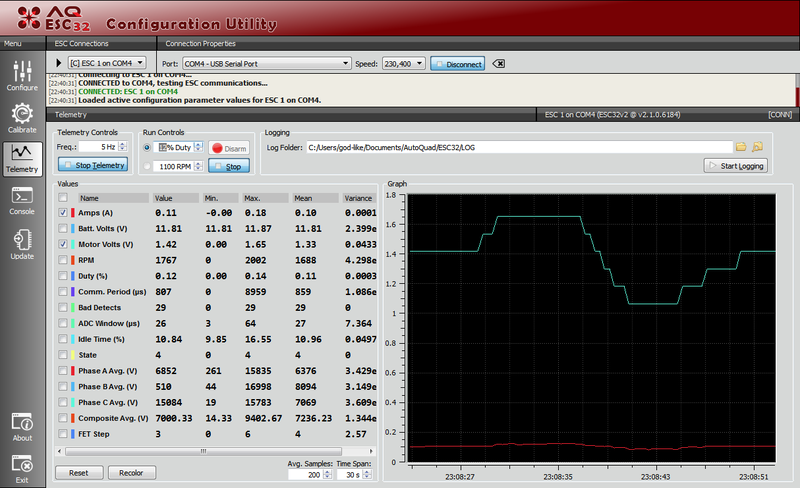 ESC32 telemetry can also be streamed over CAN to the Autoquad QGC widget to display in the ground control station. Telemetry allows to monitor and record a number of values such as RPM, Duty, temperature (ESC32 V3 only), Currents and Voltages, as live telemetry at rates of 1-10 hz. The AutoQuad ECU has a telemetry view. Simply connect the ESC32 to the ECU, configure an update frequency between 1 and 10 Hz and click “Start Telemetry”. 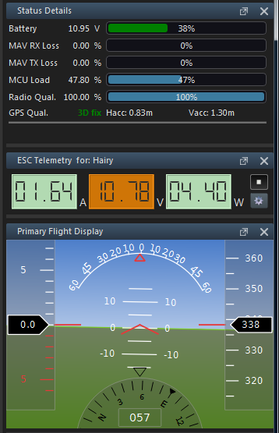 ESC32 telemetry is available on AutoQuad flight controllers over the CAN-bus as a widget that can be displayed in Qgroundcontrol. * ESC32 connected via CAN bus to the AQ flight controller. * AQ firmware version 7.1.1852 or greater. * ESC32 firmware version 2.1.0.r58.b6185 or greater. You can configure the displayed output to your needs. Warning levels can be fine adjusted to match your setup. When QGC is not connected to any system, you can set default warning/error levels for any new systems that you connect later. Once a UAV is connected, you can set warning/error levels for that specific system. Note: On ESC32 v2 you get an Error Count field, while on ESC32 v3 it is replaced by a Temperature field. That should be the only difference. You will have all relevant info of your craft including warnings at a glance. The widget can be arranged and also displayed as a single window. Simply uncheck “Show Data Table” option to get the the most compact view. Some more screenshots of possible warnings depending on the warning levels previously set. This page was created on 11-Aug-15 by jussi. Last modified on 23-Aug-15 by MaxP.